Paris is a busy, bustling place. I was once chased down a street by a dog after watching some rugby there – exciting stuff! 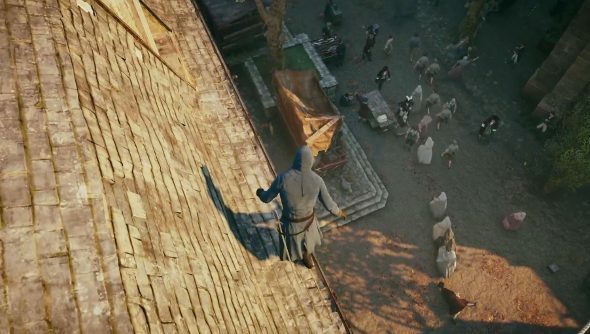 Ubisoft reckons that its digital version of Paris in Assassin’s Creed Unity is pretty exciting and realistic too. As always, Unity will be stuffed with diversions, some returning, some completely new. Creative director Alex Amancio goes over what you can expect when you’re sauntering out the 18th Century city. It’s about time that contracts had more to them than just murder. Black Flag spiced things up with naval contracts, but their lack of narrative or context did make them wear a bit thin. Not sure about the investigations, though. Remember them in Assassin’s Creed III? Heap of old rubbish, barely involving any actual investigation. But they were presented much like they have been this time around. Hmmm! But gosh, doesn’t Paris look bloody lovely. Even after the countless videos which Ubisoft has put together, the city still looks impressive. I am not at all convinced that this necessitates the ridiculous system requirements leaked earlier today, however. If the requirements are official, then it might be a case of them being puffed up, just like The Evil Within requirements. Unity sounds ripe for a Port Inspection, I reckon.